Jeana Greulach's over-sized mugs are inspired by and made for families who spread love and acceptance. In your house, there's only one rule: respect everyone and everything. 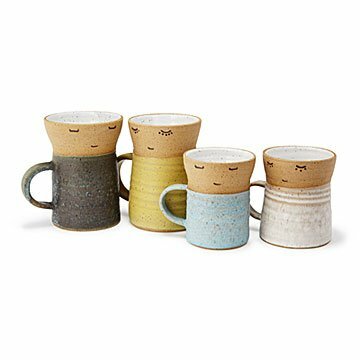 Jeana Greulach's handmade mugs are a playful representation of your open-minded family. She throws each one on a potter's wheel, dips it in a rich glaze, and inscribes it with a sweet expression. Fill the over-sized mugs with coffee or tea, and a splash of positivity. A great gift for your favorite inclusive crew, they're a lovely reminder to keep spreading love and acceptance. Mugs sold individually since no two families are exactly the same. Handmade in Westlake Village, California.